Ideal for the growing business, the Konica Minolta Bizhub C308 colour mid-volume multifunction printer has print, copy, scan and fax functions. With a large 9-inch colour touchscreen and good mobile printing features, the Bizhub C308 colour laser printer is a great addition to any productive office that needs an expandable MFP printer. The Konica Minolta C308 colour laser MFP weighs 85kg and is designed for an office with room for expansion. 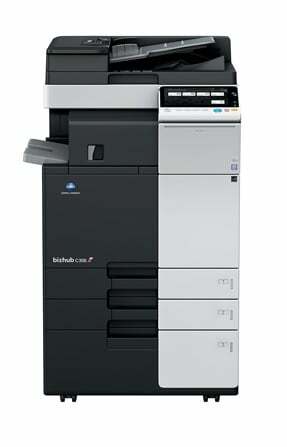 It operates at 230 – 240V and the copy resolution on the Bizhub C308 MFP is 600 x 600dpi. Print resolution is higher at 1800 x 600 or 1200 x 1200dpi. The printable paper weight for the Bizhub C308 colour multifunction printer is 52 – 300gsm. There is excellent support for mobile printing on the Konica Minolta Bizhub C308 colour multifunction printer with AirPrint, Google Colour Print or optional Wi-Fi Direct connectivity. The fast print speed of 30ppm and use of Simitir HD polymerised toner in the genuine Konica Minolta Bizhub C308 toner cartridges ensures fast, high resolution printing of business graphics. The original Konica Bizhub C308 toner cartridges deliver a cheap cost-per-print thanks to the high yields of the 28,000 page black toner or 26,000 page CMY cartridges. With dimensions of 615 x 685 x 779mm, the Bizhub C-308 A3 colour MFP is a rather hefty unit that will need plenty of floor space, especially if add-ons are required.